Alissa is a twelve-year old orphan who becomes the Librarian Apprentice for the constantly moving Library of Secret. She soon learns that the Library is one of Seven Magical Libraries by the current Librarian, Henry Kennings. A year later when Alissa is celebrating her thirteenth birthday, the Library of Secret detects a shift in time caused by the Library of Sorrow and their quest to reunite the evil black books. 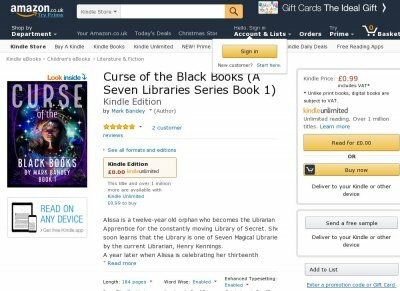 As the Library travels through space and time, be part of this new series of seven adventures by downloading now your copy of Curse of the Black Books. Read about how Alissa and her new found friends battle with the Library of Sorrows Dark Author, Septus Faulkes. Are they going to succeed in preventing Faulkes and his followers from reuniting the black books Well, I hope so because if they dont then the course of history will change forever. This will appeal to fans of Harry Potter and Doctor Who.